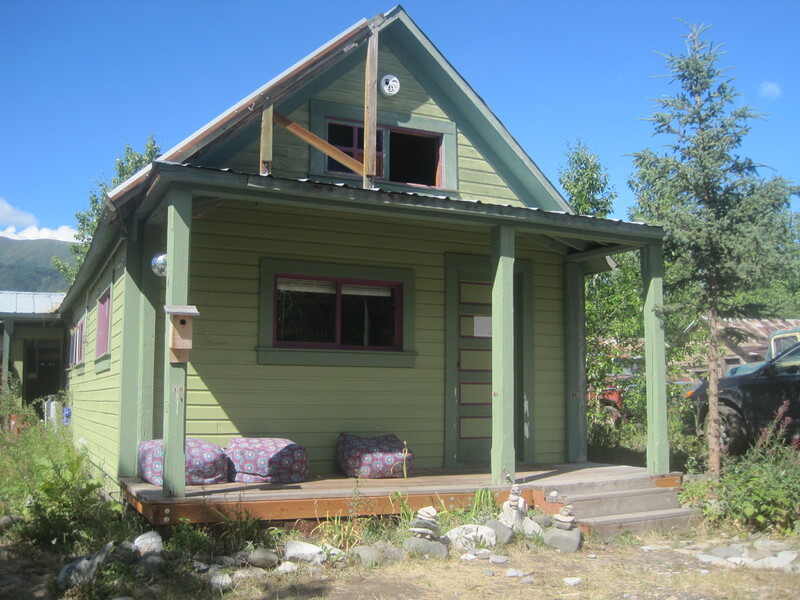 We bought this little gold miner’s cabin in 2009. 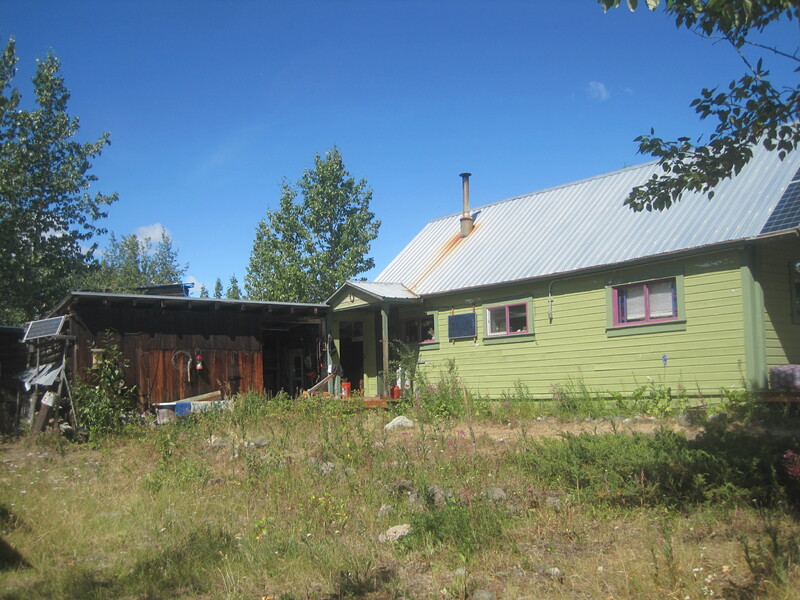 The cabin was originally built by a gold miner for his wife in 1920 when McCarthy was a booming mining town. They, with their two daughters, lived here year round. 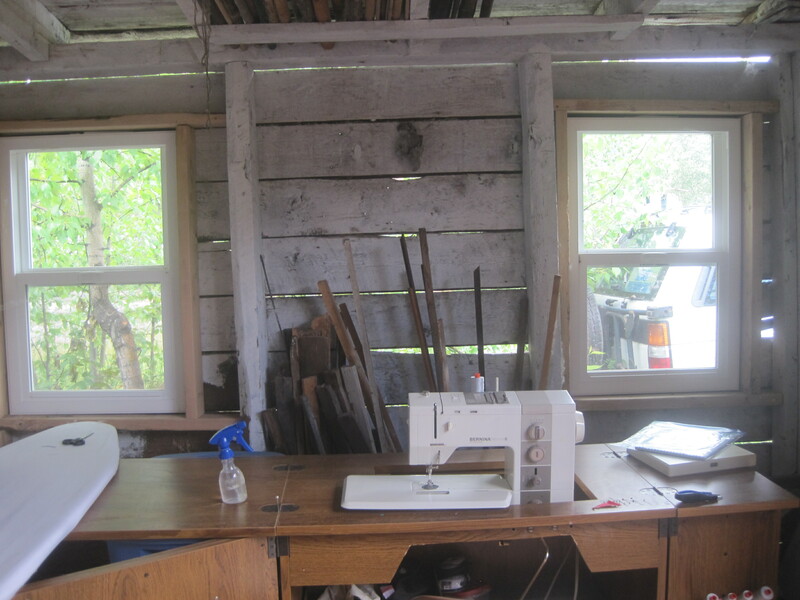 When we purchased the cabin it was a dream of mine to convert part of the old garage into a small sewing studio. The biggest obstacle to doing this was creating a solar system that could juice an iron. Sewing machines, even the fancy computerized ones, take very little electrical power, but an iron is one of the biggest energy drains you can put on a system. Our cabin came with this little solar panel which powered small electronics and lamps. Several years back, I wrote a grant requesting funds from the Sustain Arts Foundation to build and power an off the grid sewing studio so that I could be out in McCarthy with our boys and still work without a generator disturbing the peace and quiet of downtown McCarthy. The Sustain Arts Foundation funds artists and writers with families. And they funded me so while I work, my kids can do stuff like this. AWESOME. 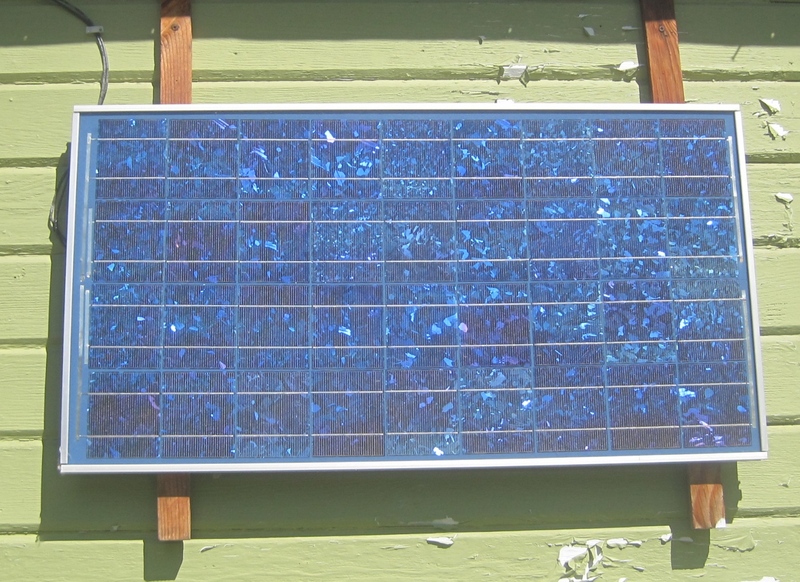 With the grant from the Sustainable Arts Foundation, we were able to install these two beautiful solar panels on the side of our house. With these panels, I can iron on most sunny days. If we get a streak of rainy weather, the system is set up so that I run the generate for about half an hour, and it juices everything back up for the day. 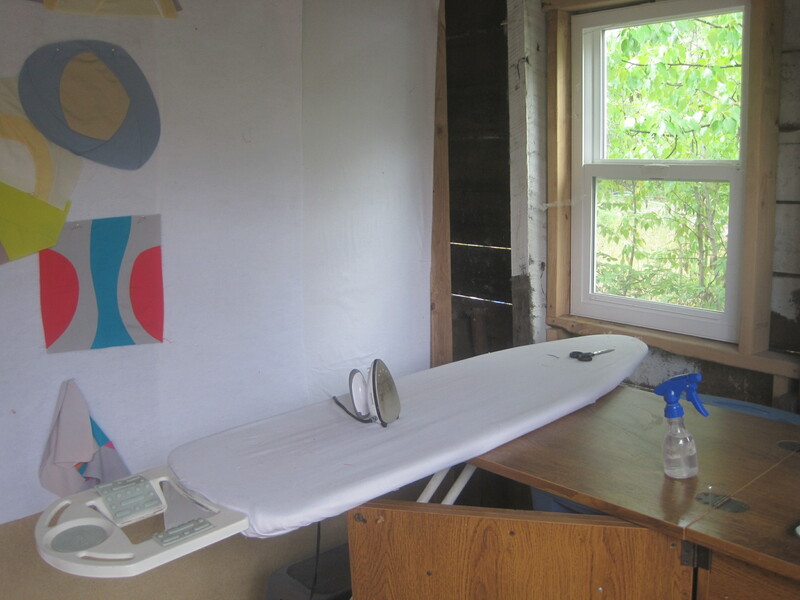 Last year, I used about five gallons of gas to power my iron and sewing machine for two months of sewing. This year, with all of the sun we’ve been having, it will be much less. This is the other side of the cabin. Yes, this town has an old truck problem. 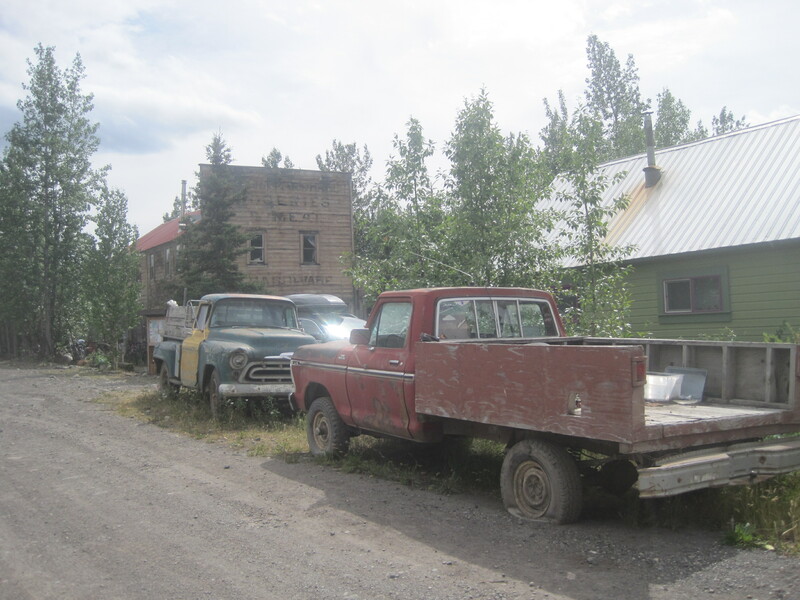 And just beyond those trucks is the opening to the original garage built to store the gold miner’s Model T Ford. 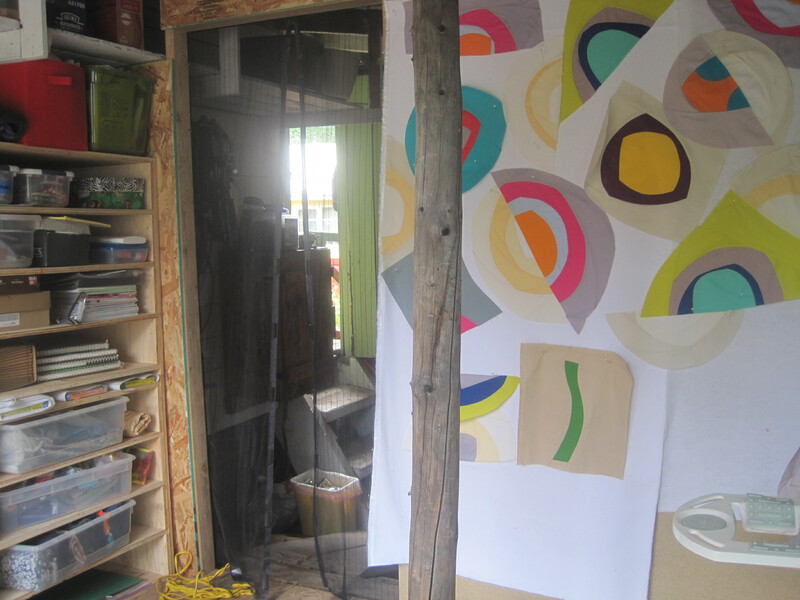 When you open those barn doors, there is a set of screen doors, and beyond that is my studio. It is primitive, but it works! I spend my mornings trying to catch up on emails and other business activities. Usually by mid-afternoon, I get to actual studio work. 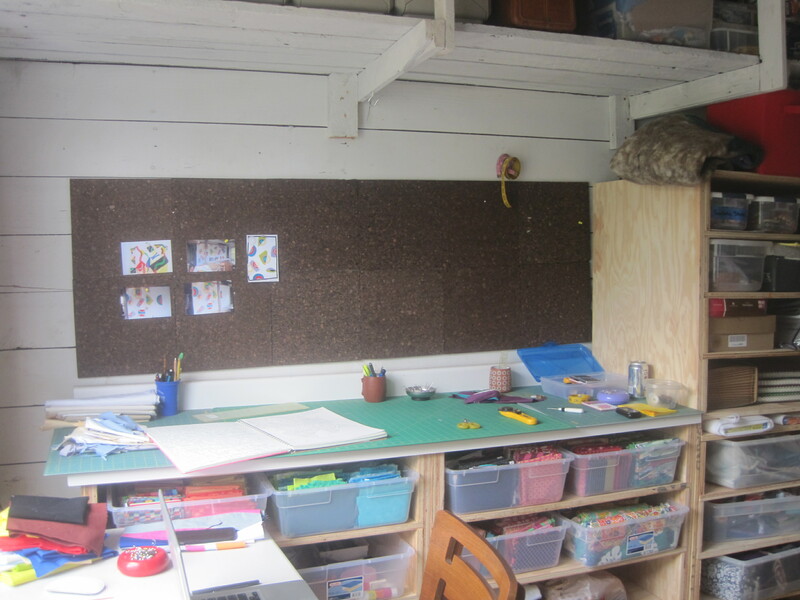 I have a very nice cutting station and fabric storage similar to my studio in Anchorage. The doorway on the backside of the studio leads to the back half of the old garage which will eventually be a nice storage area with shelving and hopefully some modern version of a cold storage. 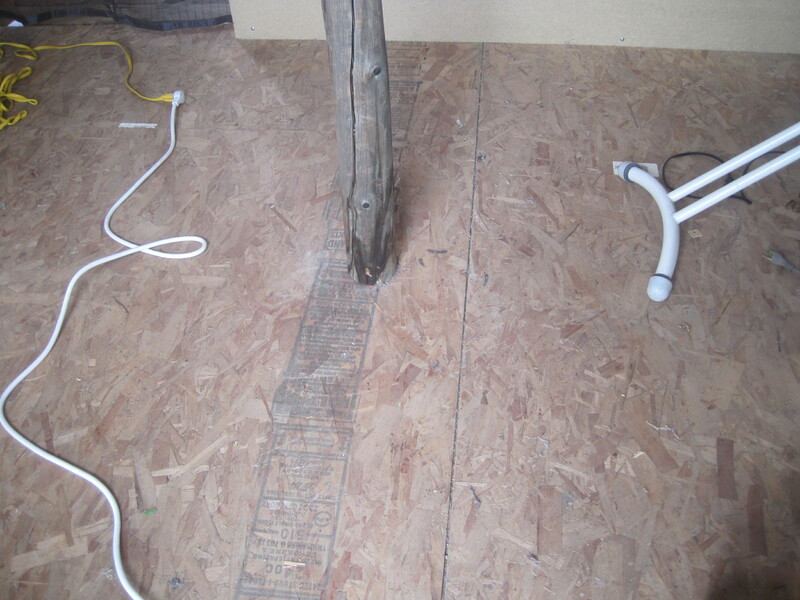 The floor in my studio originally looked like this. 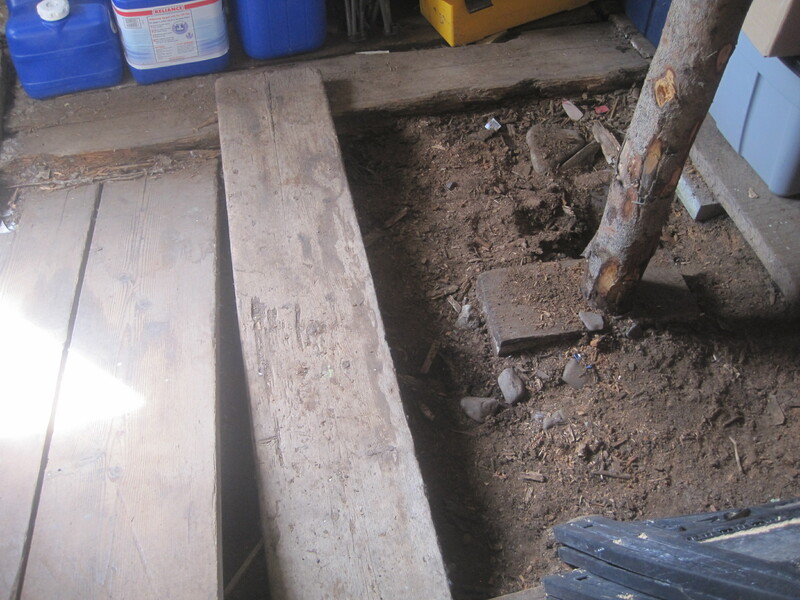 But Walt raised the floor and it now looks like this. I have a very large design wall here. In fact, it is my largest design wall. Too bad it has a pole in the middle of it! Still it works great. This year, we installed particle board for my design wall. I hope next summer we will cover it with felt, but for now, It is a mixture of batting, flannel, and felt. 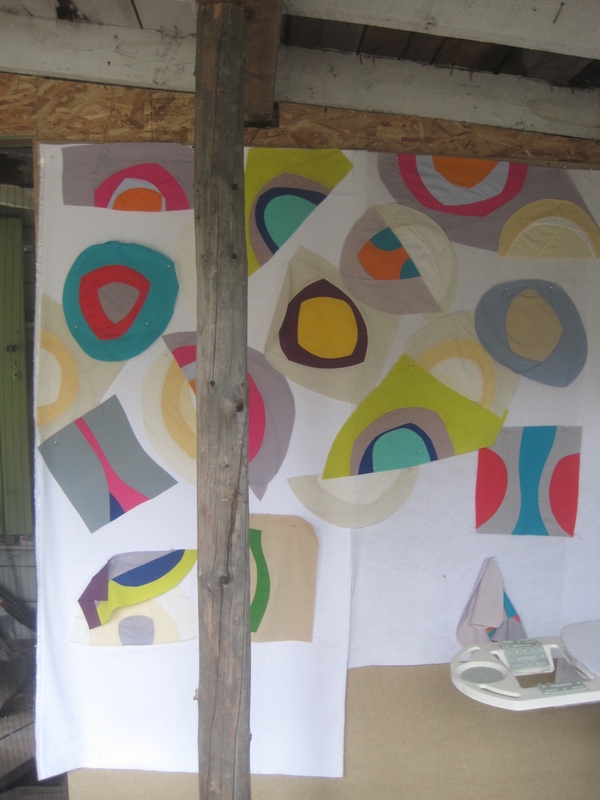 For those of you who are curious, this is one of my unfinished assignments from my last two weeks at the Crow Barn. Progress is slow and iffy. I have a proper ironing station. Out here, I use what I call an Eco-Iron. Its real name is SteamFast. It is the lowest wattage iron I have found so far. It takes a bit to get it going, but eventually it heats up nicely, and it travels well too. My sewing machine faces out into our backyard. Next year, I hope to replace the sewing table. It just does not work with my machine. 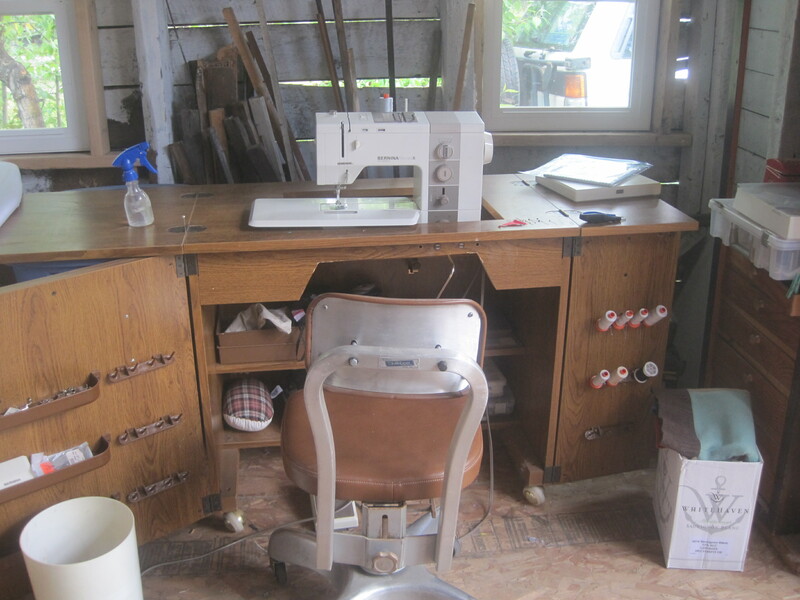 I am hoping Walt will build me a wrap around sewing station. That would be sweet. As you can tell, this really is a plein air studio. I get a nice breeze and sunshine through the holes in the wall. 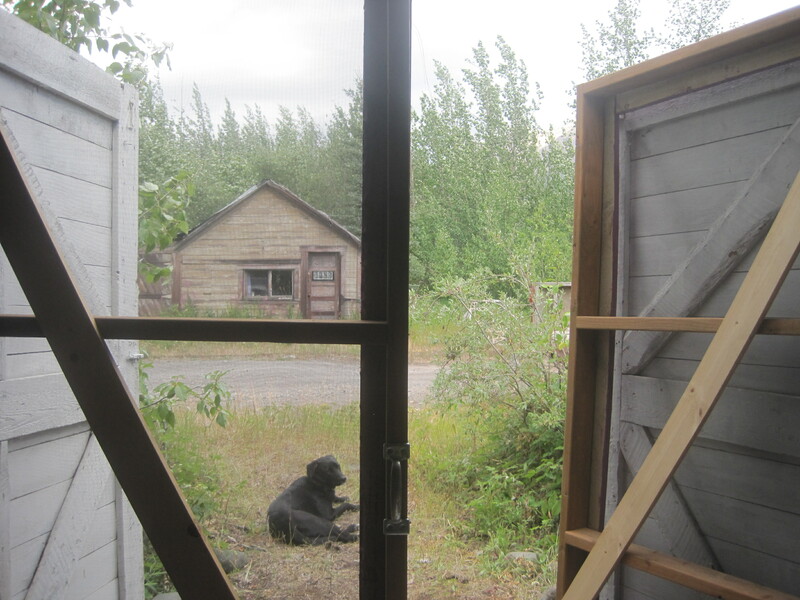 This is the view from my computer–a dirt road, a dog, and a broken down house. I like it. 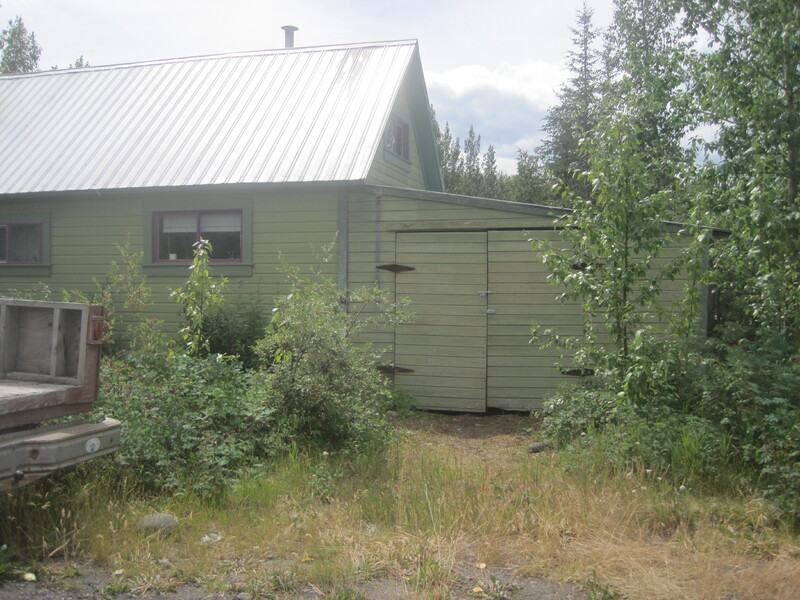 And that is my summer studio in McCarthy, Alaska. It is rustic, solar, and totally functioning. It works. I like it. THANK YOU Sustainable Arts Foundation for funding artists and writers with families! 20 Jul	This entry was published on July 20, 2015 at 4:52 PM. 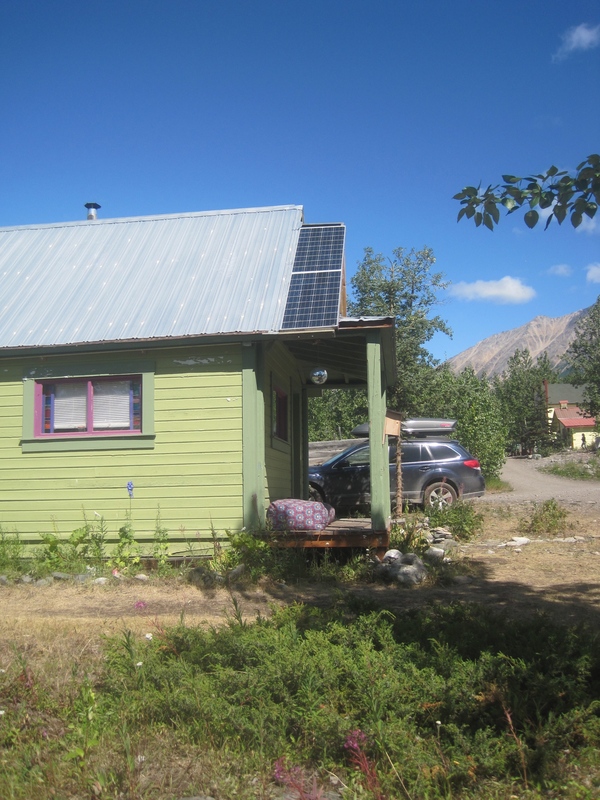 It’s filed under News And Events and tagged Alaska, McCarthy, Off-the-grid sewing studio, Solar Powered Studio. Bookmark the permalink. Follow any comments here with the RSS feed for this post. I like it, too! Someday I’ll have to come to McCarthy and see it in person! Yes! You do need to come see it in person. I would love that. Mary, I have been very fortunate. Of course, I’ve got plenty of rejections to go along with the yeses. That is the way it works. I hope your summer is going great! And thank you for stopping by. 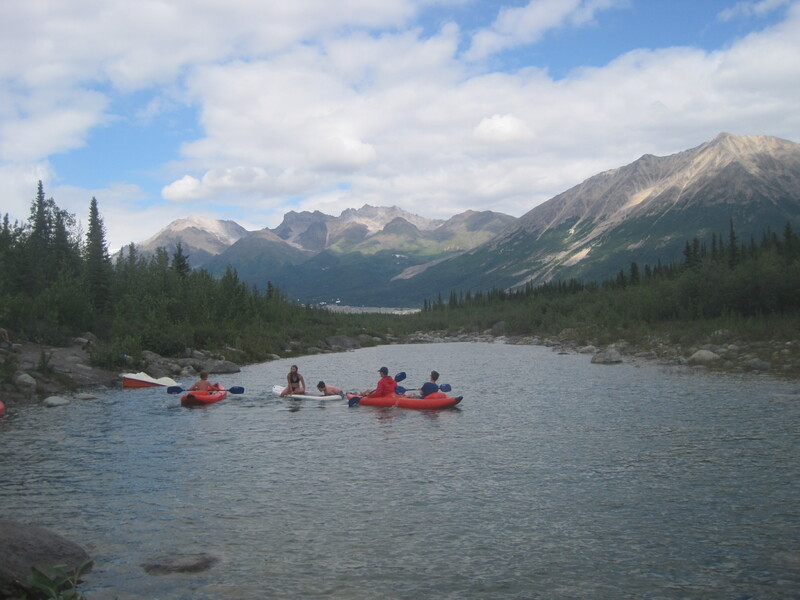 That photo of your family our in kayaks – I wish I could transport myself there! Beautiful place to get to work! The swimming hole adventure was last Saturday. We had a full on White Water Festival here in town. One of the guiding companies set all of the kids up with rafts, kayaks, and paddles. It was great fun. Thank you Jeanne! Nice workspace, and you are so lucky to have it where you love to be. I love the circles thingy. Your colours are amazing, as usual. 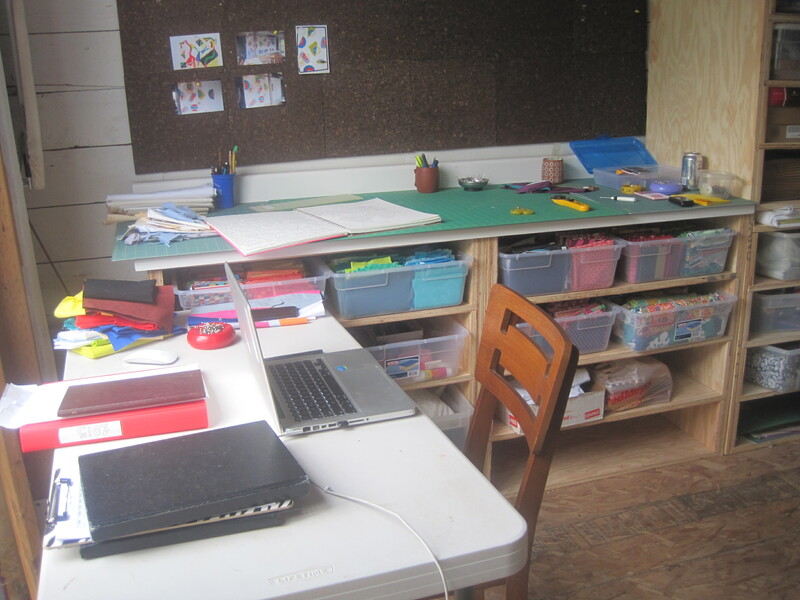 Barb- while I was writing that post, I kept thinking about your wilderness studio space. I hope you are getting some good work done. The circle composition is giving me grief, but today is super sunny and I think I am going to just go for it. Get it done! Thank you for stopping by. I so enjoy your posts, Maria. I can almost feel what it would be like for this Maryland-er to be plunked down in Alaska. Fantastic. Sue- thank you! Maybe someday you will visit. I would love to share a bit of my world with you. Hi Maria.. Congrats on the power! You never cease to amaze and inspire all of us with the tours and stories and FUN! I am certainly enjoying following your summer life’s experiences and thinking I have to be able to get a few grants under my belt for “sustainable art”… grant writing lessons??? Bethany, I am going to do some more posts about grant writing and funding….some day soon. When it starts rainy maybe.Thank you! I can’t wait for you to see either. I hope the weather is as good as it has been! That old truck problem could also be seen as a series of awesome photo shoot locations – gorgeous quilts/art against the aging shapes and textures of the vehicles …..
Those old trucks ARE the source of inspiration for dozens of artists! I don’t know how many times we have gone to a group exhibition and discovered a painting or water color or photo of our cabin and those trucks! How cool! Thanks for sharing it with us. Thank you for the tour of your summer world!!! What a wonderful place! Thank you Dee! It is truly a wonderful place. A little nutty but absolutely lovely. Thanks, I really enjoyed seeing your studio space in McCarthy. 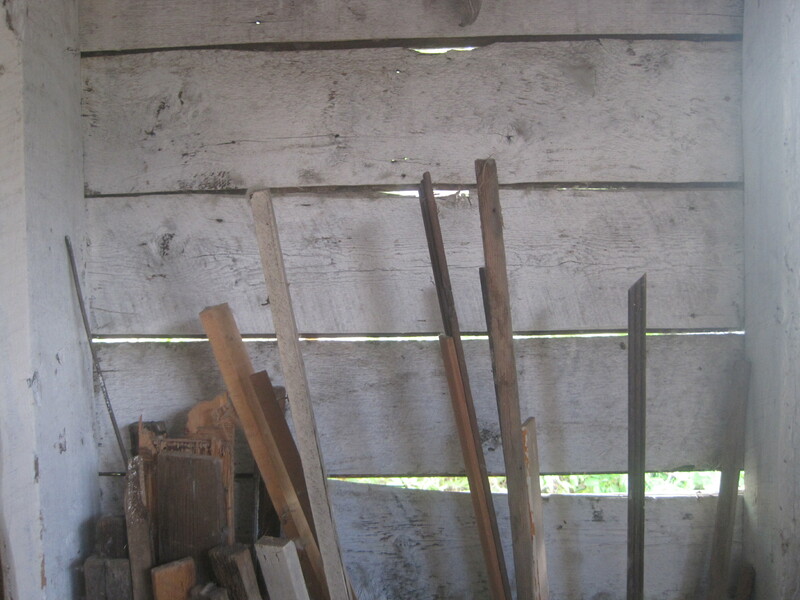 I’ve been curious about your work at the barn this year, so it was fun to get a glimpse at that in progress, as well. Sometimes my sewing space consists of a tiny table with a small cutting mat, my featherweight and a travel iron plugged into an outlet on the outside of our horse trailer. It’s not quite like the home studio, but with a little pre planning I can still get a lot of work done and fresh air besides! Thank you for stopping by Marla! I am with you, I can make do just about anywhere as long as I have my sewing machine! 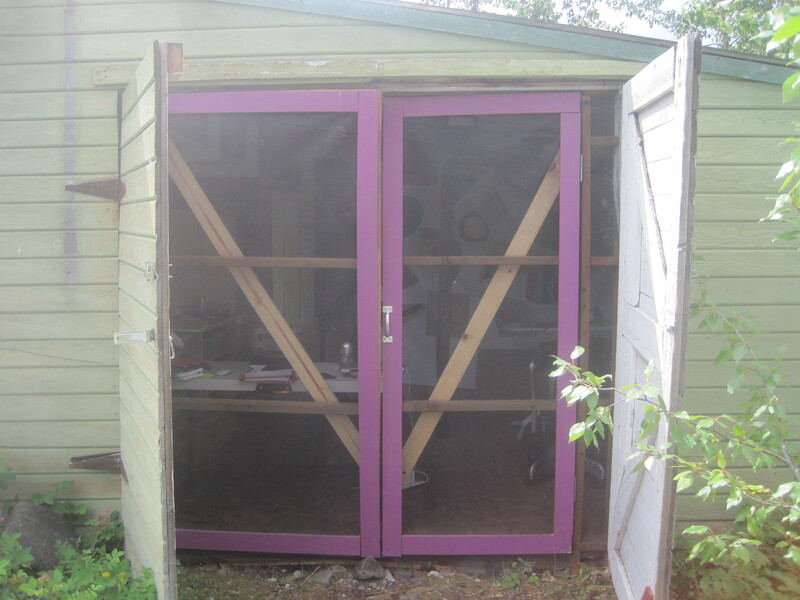 I love your purple screen doors! Thanks for the pictures of your studio. I very much enjoy looking at them. Heh, plein air indeed. But you have an excellent view! Thank you Carrie! I love the plein air, although it does mean that this is really a summer studio. 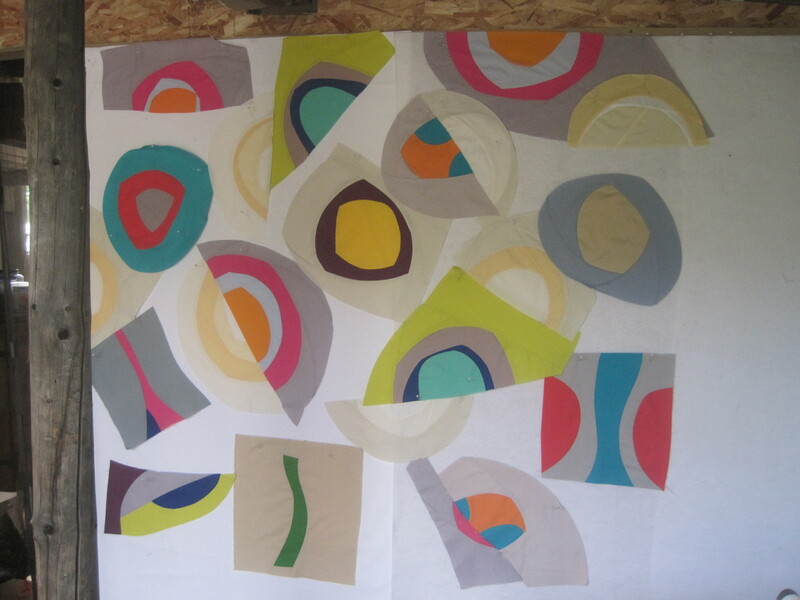 I hope you are still making progress on your big green quilt! That’s so sweet! A dream come true 🙂 Congratulations. Thank you! I think you should come visit!